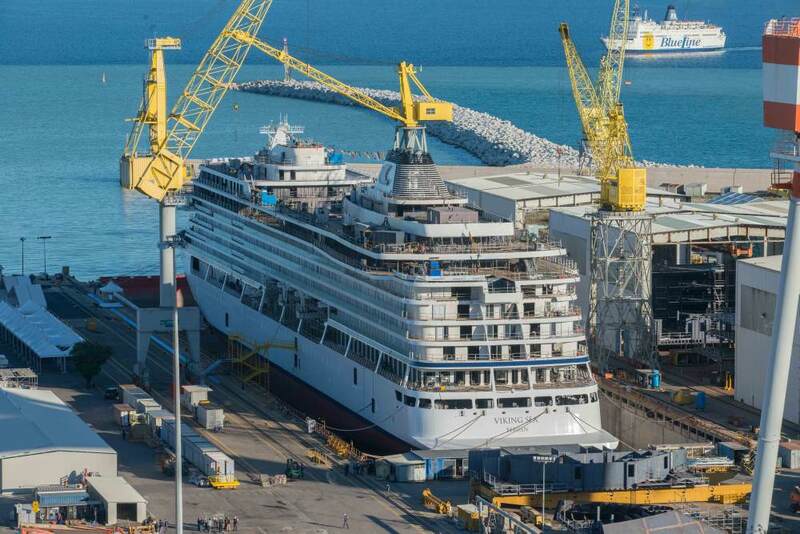 On Thursday the second ship in the Viking Ocean Cruises fleet, Viking Sea, was floated out at Fincantieri’s Ancona shipyard in Italy. 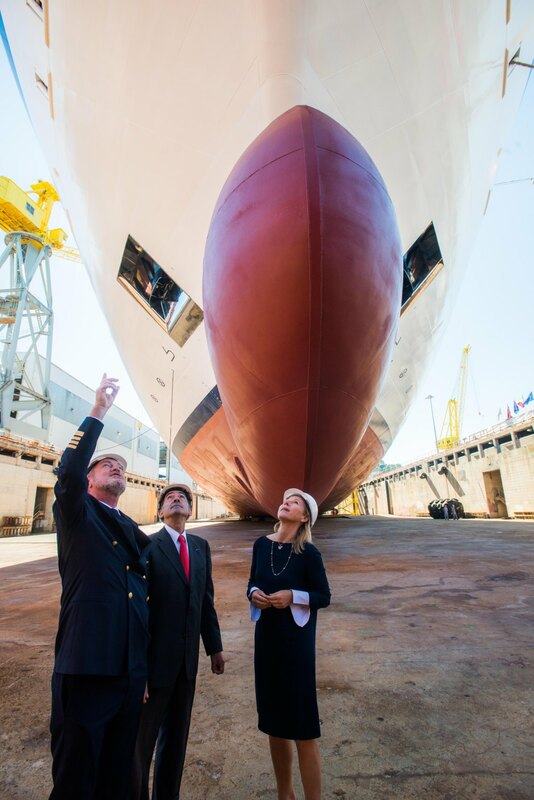 This major construction milestone was the first time the new ship had taken to the water. The ceremony took place on the same day as Carnival Vista‘s coin ceremony. 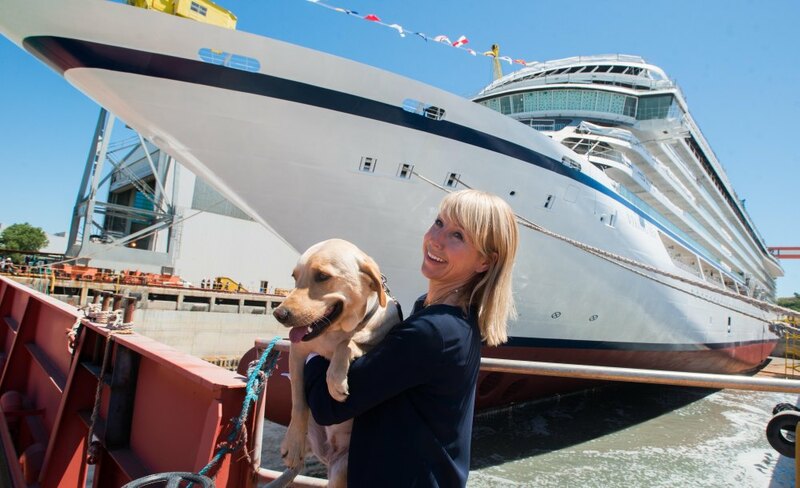 In addition to the float-out of Viking Sea, the company also announced that Karine Hagen, Viking’s senior vice president of product and daughter of Torstein Hagen, founder and chairman of Viking Cruises, will be godmother to Viking Sea and will officially name the ship during the christening ceremony in early 2016. She is the author of the children’s books, “The World of Finse”, an educational series that showcases the adventures of Karine’s yellow Labrador, Finse, set largely along the global destinations and routes of Viking’s cruise itineraries. 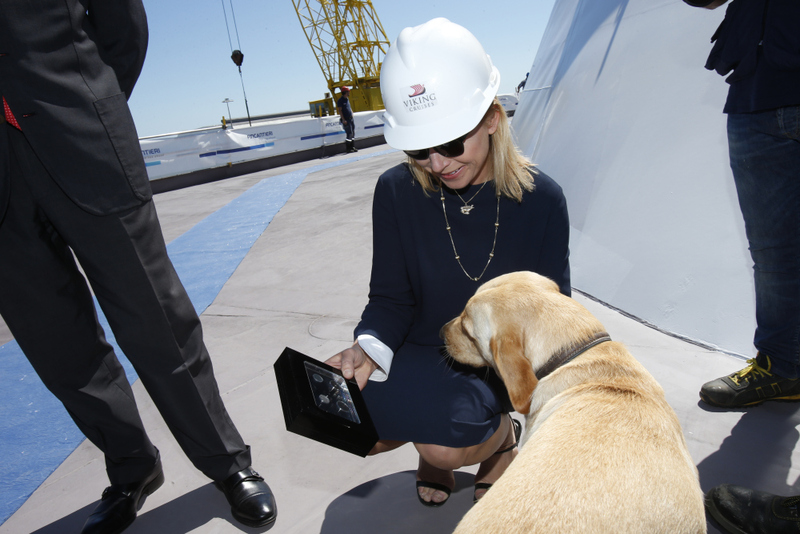 Viking Sea’s godmother, Karine Hagen, and her yellow Labrador, Finse, during the ship’s float out ceremony on 25 June. Viking Sea‘s float out began at approximately 10:30am local time, with the maritime tradition of welding coins under the ship mast. Karine welded Norwegian commemorative coins representing four generations of birth years in her family: 1911 (grandmother Ragnhild, after whom the onboard restaurant Mamsen’s is named); 1943 (father Torstein, Viking’s chairman); 1970 (Karine’s own birth year) and 2012 (Karine’s Labrador, Finse, who was also present at the ceremony). Karine then cut a cord allowing water to flood into the ship’s building dock. Following a two-day process that set Viking Sea afloat, she was then moved to a nearby outfitting dock for final construction and interior fitting. 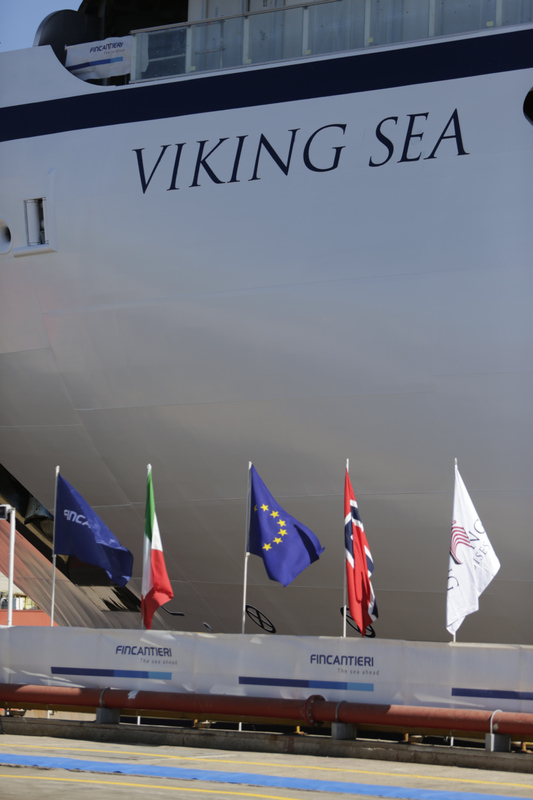 The first ship in the Viking Ocean Cruises fleet, Viking Star, was christened in Bergen, Norway, just one month ago. 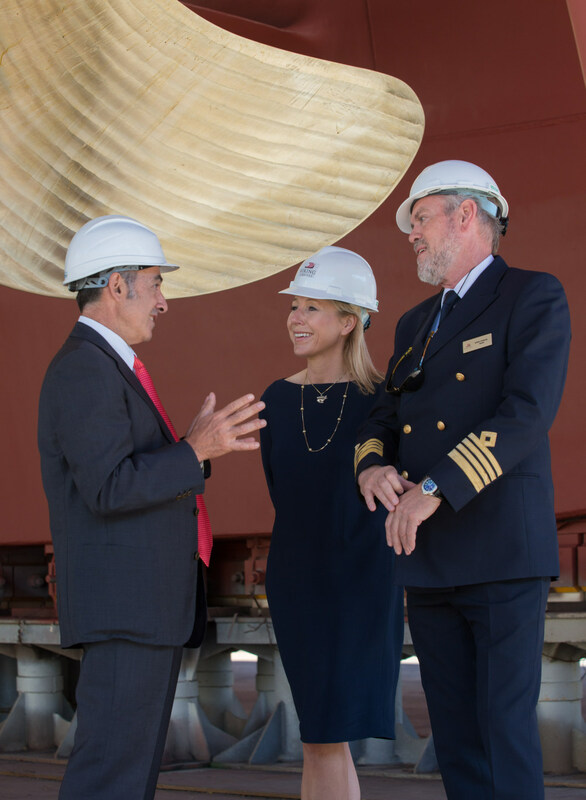 The third vessel in the fleet, Viking Sky, is currently under construction in Ancona and will launch in 2017. All three 930-passenger cruise ships will sail routes in Scandinavia and the Baltic; and the Western and Eastern Mediterranean.